A test car was rear-ended by a Nissan Leaf while merging onto an expressway, according to an account on TechCrunch. The Apple vehicle suffered "moderate" damage. Details are still forthcoming, so it's unclear if the fault was with the Nissan driver, Apple's hardware and software, or some combination of the two. Ridesharing service Uber all but scrapped its self-driving tests once someone was killed in Arizona. 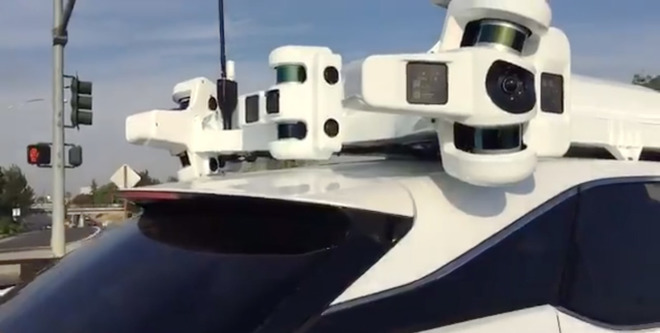 Apple has been working on self-driving car technology for several years, originally under the moniker "Project Titan." While the company was originally thought to be after a fully self-designed vehicle, at one point the effort downscaled to a platform, and further rumors suggested the long-term goal had shifted to ride-hailing. More recently though, analyst Ming-Chi Kuo —known for his connections in the Apple supply chain — said that he believes the company will still deliver an "Apple Car" sometime between 2023 and 2025. Former engineering executive Doug Field recently returned to Cupertino after a nearly five-year stint at Tesla. Apple has dozens of self-driving test cars on California roads, and that number may continue to increase once a real-world product is on the horizon. Update: The Apple vehicle, a Lexus SUV, was merging onto the Lawrence Expressway in California's Bay Area on Aug. 24, Gurman later wrote, citing a filing by Apple's Steve Kenner with the Department of Motor Vehicles. The Leaf was moving at just 15 miles per hour, but was also damaged.